One of the more pleasing sights on our typically grey and dull motorway system is that of a happy hound pressing his or her furry face up against the window of a slower vehicle. As one overtakes, man's best friend will often give you a knowing look or a wag of the tail in appreciation of seeing another human being. It breaks up an otherwise long and boring journey nicely. But imagine pulling up behind a Nissan SUV and seeing the face of a lion pressed up against the rear windscreen. That's exactly what happened in Dubai where one lucky (or unlucky, depending on how you view things) driver managed to capture the bizarre scene on camera. 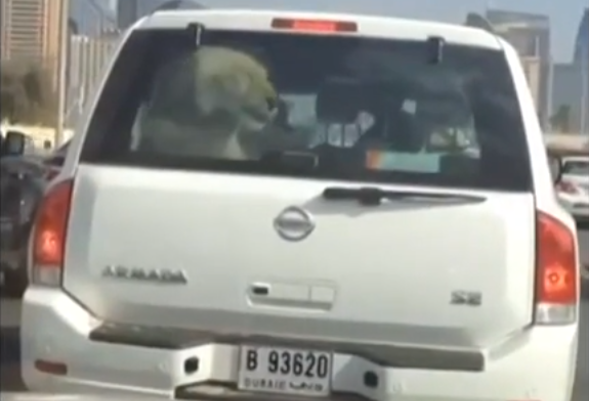 The footage shows the wild beast casually strolling around the rear of a Nissan Armada while it sits in standstill traffic on Dubai's main highway Sheikh Zayed Road. The short clip has since gone viral after it was posted to YouTube earlier this week, with many commentators refusing to believe the footage is genuine. Keeping wild animals has become a common occurrence among the wealthiest inhabitants of the United Arab Emirates as millionaires attempt to outdo each other with ever more exotic pets. According to 999 English, the official monthly magazine of the Ministry of Interior, residents of wealthy neighbourhoods are becoming increasingly worried by the amount of wild and potentially dangerous animals wealthy individuals are keeping as pets. One resident told the magazine: "Our neighbourhood is turning into a mini safari. The only difference is that the residents are the ones roaming the concrete jungle while the wild animals cruise in air conditioned cars."